Professor Brian Caldwell – index of publications and presentations. Caldwell, B.J. (2018). The Alignment Premium, Melbourne: ACER Press – available for pre-order. Benchmarking Australia’s student achievement, professional autonomy and system adaptivity. It is time for a new narrative on schools in Australia. Lifting Australia’s performance on international assessments depends on top-class teaching and learning that meets the needs of all students in all settings. 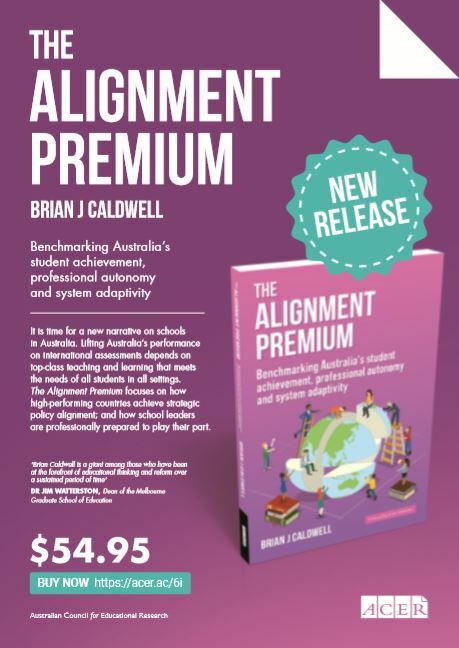 The Alignment Premium focuses on how high-performing countries achieve strategic policy alignment; and how school leaders are professionally prepared to play their part. Caldwell, B.J. (2016). The Autonomy Premium, Melbourne: ACER Press. 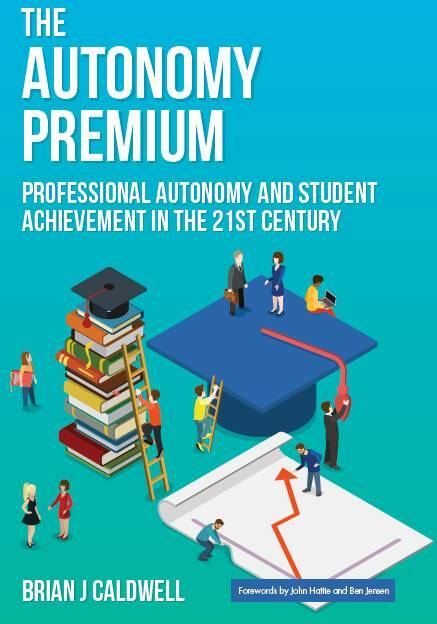 The Autonomy Premium, describes and illustrates what successful schools with a higher level of autonomy do with their new authority and responsibility to achieve improved outcomes for their students. Drawing on national and international research, with illustrations from case studies in Australia, Brian Caldwell shows how the links to learning can be made. The focus is on building the capacity of schools to make the best decisions in the interests of all students in every setting. It is not enough to provide more autonomy; schools must have a capacity to take it up. Professional autonomy trumps structural autonomy. The evidence base is growing stronger by the day and schools are becoming increasingly adept in delivery. Guidelines for schools and school systems can now be offered with certainty of success, making this book essential reading at a time of rising expectations for the profession. Caldwell, B.J. and Spinks, J.M. (2013). The Self-Transforming School, London and New York: Routledge. This is the fifth book by Brian Caldwell and Jim Spinks, all published by Routledge (initially Falmer Press), commencing with The Self-Managing School in 1988. The book offers a 50 year perspective, reviewing developments over 25 years from 1988, and then looking ahead to 2038 to describe the major forces likely to shape the development of schools. Significant themes in the emergence of ‘the self-transforming school’ are identified. Caldwell, B. (2013). Let’s get on with Gonski, The Australian, 3 April. Caldwell, B. (2013). Let’s bring on a real education revolution, The Age, 16 August. Caldwell, B. (2013). Dear PM, Please don’t appoint an education minister, Sydney Morning Herald, 16 August. Caldwell, B. (2013). Please vacate the area of school education (A letter to the incoming Prime Minister – written prior to federal election), Professional Educator, Vol 12, No 4, November pp. 22-23. Caldwell, B. (2013). An uplifting narrative on school autonomy, Australian Educational Leader, Vol 35, No 4, p. 7 (November). Caldwell, B.J. and Spinks, J.M.(2013). Leading the Self-Transforming School, Seminar Series Paper 223, Melbourne: Centre for Strategic Education. Caldwell, B. (with Dan Carr) (2013). Fast-tracking teachers will lead to educational disaster? Not quite . . . . , The Conversation, 14 November. Caldwell, B. Common Cause in Arts Education. Invited keynote presentation to Arts Up Front: ACT Arts Education Conference, Canberra, ACT, 23 February 2013. Caldwell, B. Leading the Self-Transforming School. This paper was contributed to the Annual Roundtable of the Asia Pacific Centre for Leadership and Change, Hong Kong Institute of Education, held at East China Normal University, Shanghai, China, 10-12 March 2013. Caldwell, B. Will Gonski Make a Difference? Beyond Gonski – Reviewing the Evidence on Quality Education. Responding to the report alongside Jennifer Buckingham (Research Fellow, Centre for Independent Studies) and Tim Dodd (Education Editor, Australian Financial Review) at the Australian Catholic University, North Sydney, 18 March 2013. Caldwell, B. Engagement. Presented at the launch of A Different Journey – Youth in Learn Locals: Report of a project with the Bayside Glen Eira Kingston Local Learning and Employment Network (BGK LLEN), 20 March 2013. Caldwell, B. Leading the Self-Transforming School. The Transformation of Learning. Seminar presentations based on themes in The Self-Transforming School at the Graduate School of Education, University of Melbourne, 11 May 2013. Caldwell, B. 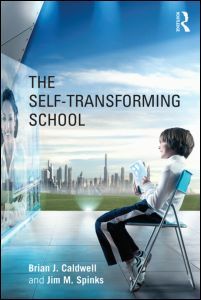 The Self-Transforming School. Workshop presentation at the Oxford Education Conference, Sydney, 24 May 2013. Caldwell, B. Leading the Self-Transforming Christian School. Presented as an invited keynote address to open the National Policy Forum of Christian Schools Australia, Canberra, 27 May 2013. Caldwell, B. Leading the Self-Transforming School. Invited contribution to a seminar on the theme ‘Bright Spots in School Leadership’ at a conference of Teach for Australia, Melbourne, 5 July 2013. Caldwell, B. The Self-Transforming School. Invited Keynote Address to open the 2013 Conference of the Monash Waverley Network, Department of Education and Early Childhood Development (DEECD), Torquay, Victoria, 24 July 2013. Caldwell, B. The Self-Transforming School. Presented for the Public Policy Institute’s inaugural Parliamentary Policy Seminar at the Australian Catholic University, Sydney, 15 August 2013. Caldwell, B. Schools of the Future: a Pedagogical Perspective. Invited presentation to the Association of Independent Schools (AIS) NSW Executive Team, 22 August 2013. Caldwell, B. and Spinks, J. The Self-Transforming School. 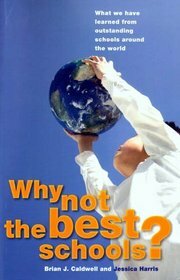 Presented at the 2013 book launch seminars in Melbourne (19 August), Sydney (23 August) and Canberra (26 August). Caldwell, B. The Self-Transforming School. Invited presentation for the Public Policy Institute, Australian Catholic University hosted by Merici College, Braddon ACT, 26 August 2013. Caldwell, B. Leading the Self-Transforming School. Presented as the Ann D. Clark Lecture for the Catholic Education Office Parramatta, 29 August 2013. Caldwell, B. Contribution to a panel presentation at the 2013 Social Ventures Australia Dialogue, Sydney, 3 September 2013. Longmuir, F. Contribution to a presentation of the Growing Great Teachers project at the Social Ventures Australia Dialogue, 3 September 2013. Caldwell, B. A review of national and international practice in voluntary certification for principals. A review of progress at a conference of stakeholders hosted by the commissioning organisation (Principals Australia Institute), Melbourne 11 September 2013. Caldwell, B. Major Forces for Change in Education. Presented at the Australian Council for Educational Leaders (ACEL) Fellows Dinner, 11 September 2013. Caldwell, B. Issues in School Education. Presentation to Rotary Clubs of Donald and Warracknabeal, Donald, 16 September, 2013. Caldwell, B. The Benefits of the Arts in the Curriculum. Invited presentation at the Conference of Dance Education in Australia’s Schools, Arts Centre, Melbourne, 26 September 2013. Caldwell, B. Leadership and Governance in the Self-Transforming School. Presented at the Annual Conference of the Australian Council for Educational Leaders (ACEL), Canberra, 4 October 2013. Caldwell, B. The Self-Transforming School. Presented at the Western Australia Primary Principals’ Association (WAPPA) Victorian Study Tour – ‘How is the State of Victoria Capturing the Leadership Premium?’, Southbank, Victoria, 6 October 2013. Longmuir, F. Evaluation of the Self-Improving Schools Pilot Program. Presented at the Independent Schools Queensland Self-Improving Schools Pilot Program Sharing Day, Brisbane, 18 November. Caldwell, B. Response to panel presentation at the launch of the Mitchell Institute for Health and Education Policy (Victoria University), Melbourne, 27 November 2013. Caldwell, B. Will We Resist the Temptation? Delivered as a response to a presentation by Jan Kronberg MLC, Chair of the Education and Training Committee, Parliament of Victoria that published a report of the Inquiry into the Extent, Benefits and Potential of Music Education in Victorian Schools. Her presentation and this response were part of a forum conducted by the School Music Advocacy Group conducted at the University of Melbourne, 5 December 2013.